Not to be confused with Independent voter, Independent politician, America's Party (political party), Independent American Party, Independence Party of America, or United States Independence Party. The American Independent Party (AIP) is a far right political party in the United States that was established in 1967. The AIP is best known for its nomination of former Governor George Wallace of Alabama, who carried five states in the 1968 presidential election running on a segregationist “law and order” platform against Richard M. Nixon and Hubert H. Humphrey. The party split in 1976 into the modern American Independent Party and the American Party. From 1992 until 2008, the party was the California affiliate of the national Constitution Party. Its exit from the Constitution Party led to a leadership dispute during the 2016 election. In 1968, the AIP was founded by Bill Shearer and his wife, Eileen Knowland Shearer. It nominated George C. Wallace (Democrat) as its presidential candidate and retired U.S. Air Force General Curtis E. LeMay as the vice-presidential candidate. 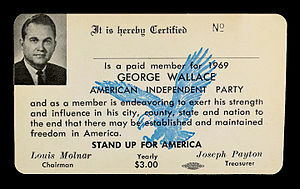 Wallace ran on every state ballot in the election, though he did not represent the American Independent Party in all fifty states: in Connecticut, for instance, he was listed on the ballot as the nominee of the "George Wallace Party." The Wallace/LeMay ticket received 13.5 percent of the popular vote and 46 electoral votes from the states of Arkansas, Louisiana, Mississippi, Georgia, and Alabama. No third-party candidate has won more than one electoral vote since the 1968 election. In 1969, representatives from forty states established the American Party as the successor to the American Independent Party. In some places, such as Connecticut, the American Party was constituted as the American Conservative Party. (The modern American Conservative Party, founded in 2008, is unrelated to the Wallace-era party.) In March 1969, the party ran a candidate in a special election in Tennessee's 8th congressional district in northwestern Tennessee, where Wallace had done well the previous November, to replace Congressman Robert "Fats" Everett, who had died in office. Their candidate, William J. Davis, out-polled Republican Leonard Dunavant, with 16,375 votes to Dunavant's 15,773; but the race was carried by moderate Democrat Ed Jones, with 33,028 votes (47% of the vote). The party flag, adopted on August 30, 1970, depicts an eagle holding a group of arrows in its left talons, over a compass rose, with a banner which reads "The American Independent Party" at the eagle's base. The American Party, as it was commonly called and legally styled in several states, ran occasional congressional and gubernatorial candidates, but few made any real impact. In 1970, the AIP fielded a candidate for governor of South Carolina, Alfred W. Bethea, a former Democratic member of the South Carolina House of Representatives from Dillon County. Democrat John C. West defeated the Republican nominee, Albert Watson, an outgoing member of the United States House of Representatives. Bethea finished with only 2 percent of the votes cast. In another 1970 gubernatorial race, the Arkansas American Party ran Walter L. Carruth (1931–2008), a justice of the peace from Phillips County in eastern Arkansas, against Republican Winthrop Rockefeller and Democrat Dale Bumpers. Carruth received 36,132 votes (5.9 percent), not enough to affect the outcome in which Bumpers handily unseated Rockefeller. The American Party had gained ballot access in Tennessee in 1970 as the result of George Wallace's strong (second-place) showing in the state in 1968, easily crossing the 5 percent threshold required, and held a primary election which nominated a slate of candidates including businessman Douglas Heinsohn for governor. However, neither Heinsohn nor any other candidate running on the American Party line achieved the 5 percent threshold in the 1970 Tennessee election, and it likewise failed to do so in 1972, meaning that the party lost its newfound ballot access, which as of 2017 it has never regained. In 1972, the American Party nominated Republican Congressman John G. Schmitz of California for president and Tennessee author Thomas Jefferson Anderson, both members of the John Birch Society, for vice president (they received well over a million votes). In that election, Hall Lyons, an oilman from Lafayette, Louisiana, and a former Republican, ran as the AP U.S. Senate nominee but finished last in a four-way race dominated by the Democratic nominee, J. Bennett Johnston, Jr. In 1976, the American Independent Party split into the more moderate American Party, which included more northern conservatives and Schmitz supporters, and the American Independent Party, which focused on the Deep South. Both parties have nominated candidates for the presidency and other offices. Neither the American Party nor the American Independent Party has had national success, and the American Party has not achieved ballot status in any state since 1996. In the early 1980s, Bill Shearer led the American Independent Party into the Populist Party. From 1992 to 2008, the American Independent Party was the California affiliate of the national Constitution Party, formerly the U.S. Taxpayers Party, whose founders included the late Howard Phillips. A split in the American Independent Party occurred during the 2008 presidential campaign, one faction recognizing Jim King as chairman of the AIP with the other recognizing Ed Noonan as chairman. Noonan's faction claims the old AIP main website while the King organization claims the AIP's blog. King's group met in Los Angeles on June 28–29, elected King to state chair. Ed Noonan's faction, which included 8 of the 17 AIP officers, held a convention in Sacramento on July 5, 2008. Issues in the split were U.S. foreign policy and the influence of Constitution Party founder Howard Phillips on the state party. The King group elected to stay in the Constitution Party and supported its presidential candidate, Chuck Baldwin. It was not listed as the "Qualified Political Party" by the California Secretary of State and Baldwin's name was not printed in the state's ballots. King's group sued for ballot access  and their case was dismissed without prejudice. The Noonan group voted to pull out of the Constitution Party and join a new party called America's Party, put together by perennial candidate and former United Nations Ambassador Alan Keyes as a vehicle for his own presidential campaign. Since Noonan was on record with the California Secretary of State as (outgoing) party chairman, Keyes was added to the state ballots as the AIP candidate. This group elected Markham Robinson as its new chair at the convention. Since the fracture of the American Independent Party between the King and Noonan factions, control of the State Party, and thus the ballot line, has been in the hands of the Noonan faction. Attempts to nominate Chuck Baldwin (the 2008 Constitution nominee) or Virgil Goode (the 2012 Constitution nominee) were unsuccessful, as were their independent efforts to make it onto the California presidential ballot. Republican Party candidates Donald Trump and Mike Pence were nominated by the American Independent Party for the positions of president and vice president, respectively, in 2016. This led to California's first instance of an electoral fusion at the Presidential level in 80 years. Did not appear on the California AIP primary ballot, but won the write-in vote, which was greater than the number of votes cast by regular ballot. The King faction website is now billed as the Constitution Party of California, stating "Vote Constitution Party--the only party fighting for a return to Constitutional government!" Its blog provides a list of "2010 California Candidates: We endorse the following candidates who are running under the "American Independent" banner in California for 2010!" As of 2016, about 3% of California's 17.2 million voters are registered with the AIP, making the party the third-largest of California's political parties, although it is far behind the numbers registered with the Democrats (43%), Republicans (28%) and those stating "no party preference" (24%). However, it has long been thought by political analysts that the party, which has received very few votes in recent California elections, maintains its state ballot status because people join the American Independent Party mistakenly believing that they are registering as "independent" voters. This was confirmed in a Los Angeles Times investigation in 2016, which found "overwhelming" and "indisputable" evidence that thousands of California voters who are registered as affiliated with the American Independent Party on voter forms in fact intended to be registered as "no party preference" (i.e., as independent voters). A 2016 poll conducted of California voters registered with the AIP showed that 73% identify themselves as "no affiliation" and 3% identify themselves as "undecided." Upon learning the AIP platform, 50% of registered AIP voters wanted to leave the AIP. A Times review of voting records revealed a wide array of Californians have fallen victim to this error, including celebrities such as Sugar Ray Leonard, Demi Moore and Emma Stone, and Kaley Cuoco. Similarly, in 2008, Jennifer Siebel, fiancée of San Francisco's liberal Democratic mayor Gavin Newsom, attempted to change her party affiliation from Republican to unaffiliated, but "checked the American Independent box thinking that was what independent voters were supposed to do." In prior years, this confusion resulted in accidentally registered AIP members being unable to vote in primary elections. A number of California registrars of voters had expressed concern over the confusion that the party's name causes. Kim Alexander, president of the nonpartisan California Voter Foundation, said that the California voter form was "confusing and somewhat misleading." However, since the advent of the "top-two" blanket primary in California in 2012, all voters may participate in primary elections where nominations for public office are to be made. Elections of members of party county central committees are still restricted to voters registered in the party where such contests may be held. ^ a b c John Myers, Would-be independents joining the American Independent Party could blame California's voter registration card, Los Angeles Times (April 19, 2016). ^ James Aho, Far-Right Fantasy: A Sociology of American Religion and Politics (Routledge, 2015), p. 15. ^ George Michael, Willis Carto and the American Far Right (University Press of Florida, 2008), p. 160. ^ Martin Durham, The Christian Right, the Far Right and the Boundaries of American Conservatism (Manchester University Press, 2000), p. 8. ^ "History of the American Independent Party". American Independent Party. 2011. ^ Chrostopher D. Rodkey, "Third Parties" in Culture Wars: An Encyclopedia of Issues, Viewpoints and Voices (eds. Roger Chapman & James Ciment: 2d ed: Routledge, 2015), p. 665. ^ ""Conservative third parties since the New Deal" in The Princeton Encyclopedia of American Political History (Vol. 1) (eds. Michael Kazin, Rebecca Edwards & Adam Rothman: Princeton University Press, 2010), p. 195. ^ "Walter L. "Walt" Carruth". findagrave.com. Retrieved May 2, 2014. ^ Tennessee Blue Book, Tennessee Secretary of State, 1971, 1973 "Elections"
^ Quirk, Cody. "AIP holds its State Convention, endorses Chuck Baldwin and reaffirms CP affiliation", Third Party Watch, June 30, 2008. ^ a b Bock, Alan. "American-Independent split Archived 2008-10-03 at the Wayback Machine". Orange County Register Horserace '08. Wednesday, July 2nd, 2008. ^ Quirk, Cody. "Statement from Jim King, AIP Chairman", Third Party Watch, July 22, 2008. ^ Winger, Richard. "Keyes Wins California Lawsuit on Procedural Issue", Ballot Access News, August 26, 2008. ^ Garris, Eric. "California Ballot: Alan Keyes Replaces Chuck Baldwin on American Independent Party Ticket[permanent dead link]", Third Party Watch, July 22, 2008. ^ And political party if different from the AIP. ^ Wallace and LeMay carried five states, receiving 45 electoral votes, plus one from a North Carolina faithless elector. ^ Brian Rohrbough was the nominee of America's Independent Party, but Drake appeared as the American Independent Party nominee. ^ Jonathan D. Ellis was the nominee of America's Party, but Ornelas appeared as the American Independent Party nominee. ^ Two Texas faithless electors pledged for Trump voted instead for John Kasich and Ron Paul. ^ Myers, John. "Donald Trump will be the nominee of two parties on California's November ballot". The Los Angeles Times. The Los Angeles Times. Retrieved 20 December 2017. ^ Winger, Richard (August 13, 2016). "American Independent Party Formally Nominates Donald Trump and Michael Pence". Ballot Access News. Retrieved August 13, 2016. ^ Blog of "King faction" now billed as the Constitution Party of California[permanent dead link] accessed August 11, 2010. ^ a b c d e f g John Myers, Christine Mai-Duc & Ben Welsh, Are you an independent voter? You aren't if you checked this box, Los Angeles Times (April 17, 2016). ^ Voting at the Political Fault Line: California's Experiment With the Blanket Primary (eds. Bruce E. Cain & Elisabeth R. Gerber, University of California Press, 2002), p. 219. ISBN 0-520-22834-0. ^ Phillip Matier and Andrew Ross (April 22, 2008). "Newsom's girlfriend stumbles into wrong party". San Francisco Chronicle. American Independent Party King faction. American Independent Party of California Noonan faction.